Notice: He took the book, it doesn't say He took the little book, but the little book was in the book that He took. 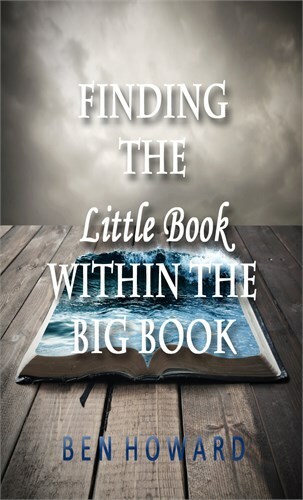 It was on October 25, 2009 that I preached the message in Glen Daniel, West Virginia, entitled, Finding the Little Book Within the Big Book . There is a little book that is very special to a very special few, and that very special few is the wife of the Lamb. The bride and the bridegroom becomes united as we become one flesh with Him. There is a very special part of the Word for us. As I go along, I want to show you what Jesus did at Calvary and how that He redeemed the whole earth and all things that are therein. Not only humanity which is at the top of the list, but even all the animals, all the trees and all the waters. He redeemed everything and bought it. Adam at one time had control of all that, he was the king of the earth. God gave Adam the earth and told him to multiply and conquer the earth, but we find that Adam failed. Throughout time God raised up different men to keep truth going forward until Jesus Christ came, the Lamb of God, the real seed of God. We know the story of His life, how He lived here for 33 years and then spilled His blood to redeem this earth and all that it consists of. God gave a book here, this Bible, and there's not going to be any other Bible. The Bible says that you can't add to it and you can't take from it, because it is complete. But there's a part in the Bible that's called the little book. Now there are two things that I want you to notice here specifically. When John sees this one on the throne with a book in His hand sealed with seven seals, it's not called the little book. That's because when we see the Big Book of Chapter 5 of Revelation, we see the whole Bible, the entire Book of Redemption. That's why the elders are saying, "Thou art worthy because thou has redeemed us from all nations, kindred, and tongues." But then when we come to Revelation, Chapter 10, Christ is seen here in the form of the Mighty Angel bringing down that part of the Big Book that is called the little book. Understanding this is very important. I want to show you this: See how big the Bible is? It's a big Book (holding the Bible). But this is the little book, and I'm just going to hold these pages (holding the pages of the 14 books of Paul's writings of the New Testament). That's the written part of the little book. The Spiritual part of this little book is what Christ brings down to interpret for us to perfect the bride, because this little book here is part of the Big Book, the whole Bible. This little book deals specifically with the wife. Seeing this makes the whole Bible more wonderful to the wife of Christ. Please hear audios and videos messages or read the books below for further understanding of the Book of Redemption. < Previous Next > The Wife of Christ Receives Both Legs of the Coming of the Lord - Remember the Feet!